The reason I have never reviewed Secret of Mana before, despite having a rather extensive oddities page about it, is because I find it difficult to review. It's a game that I've loved and held dear to my heart for years, but explaining exactly why that is can be challenging. I won't lie, a huge part of the appeal is the audio and visual aspect. The music is outstanding (still one of my all-time favorite game soundtracks) and the graphics...well, it's obvious what Square was going for here - the amount of detail in the backgrounds and character animations is stunning. I remember being completely mesmerized by it when I first played the game many years ago. Extensive use of color layering effects are used to create shadows from overhead clouds, sunlight shining through caves, and foggy forests, and Mode 7 is utilized for a high-speed ride on a dragon across the entire world. I suspect Square had Disney envy for years - they were probably chomping at the bit for that license to make Kingdom Hearts. 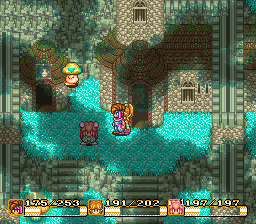 Secret of Mana looks like a Disney movie in RPG form. The game itself is like Zelda, but with (eventually) a party of three characters and an experience and weapon gauge system that gives it more of an RPG-feel. Once a character attacks an enemy, they have to wait a short bit for their weapon meter to recharge, or else the next attack will not be at full power. It's essentially a disguised turn-based system. Secret of Mana does not have quite as many items with specialized functions as Zelda does. Instead, it gives the characters a ton of different weapons to work with, some with extra-battle functions, such as a whip that lets you cross gaps and an axe that chops down road-blocking objects. Secret of Mana's world is huge and expansive and fun to explore with many memorable settings, including a weird desert with a "sea of stars" and a gorgeous forest inside a volcano. The dungeons and forests have some light puzzle-solving, but not quite the amount of puzzles that a Zelda game has. Many areas are more "run through and fight all the enemies" than "solve the puzzle to move onto the next room" type, with most puzzles involving finding and hitting different types of switches. There are a lot of boss fights with large, colorful, well-animated creatures, but this is also where the game hits a snag. Early on, the bosses can be quite challenging. The first boss, in fact, prepares you for the possibility of having to use dodging and attacking strategies by having a character explain this to you. But as you progress, your characters eventually learn magic spells that can be cast repeatedly on bosses to kill almost all of them with little effort up until the final boss. Magic, as you might guess, can also be used to heal your characters, and both your MP and MP-restoring items are plentiful. The final boss is certainly dramatic and cannot be killed by spamming magic, but once you know the trick to it, it's not difficult, either. There is also a strange change of pace in the game soon after you get the dragon, Flammie, that can fly you around the world. You'll suddenly accumulate magic and weapon orbs at such a rate that you can't really level them up just by progressing normally and using them. If you want to level them up, you have to take time out and do it in a previously-visited area. This is because some areas, like the Moon Palace and Light Palace, have almost no enemies and not much to them. And if you want your magic spells to be powerful, you'd best level them at that point because when you reach a certain part of the story, you can't level them at all until you resolve a plot point much later. This part of the game does seem a little "undercooked", and it may relate to changes during development when the game had to be scaled down from a release on the (canceled) Super NES CD attachment to a cartridge format. 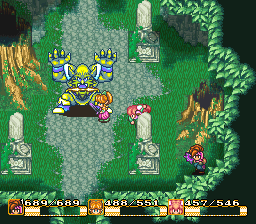 While I knew years ago that Secret of Mana's story has a very heavy environmental theme, what I didn't realize until fairly recently is that the Mana Beast attacking the Mana Fortress and causing an apocalypse appears to be a not-so-subtle atomic bomb allegory. Much of the game's plot is standard fantasy-fare: A reckless evil empire wants to resurrect an ancient weapon at all costs. It's made more interesting by the presence of a mysterious sorcerer who works for the empire, but who seems to have greater goals, and the Sprite character, who provides a healthy dose of humor. It's because of this last point that many players will feel especially bummed out by the game's ending - I won't spoil it for those who haven't seen it, but I will warn you that it's sad. Anyway, Secret of Mana is definitely a game I'd recommend experiencing at least once, even if you don't feel as compelled to level up all your weapons and magic as I was. You'll likely enjoy the sights, sounds, and humor, and the thirll of adventuring in the beautiful environments, even if your journey is a little on the easy side.